Apple iOS and Google Android smartphones and tablets continue to eat away at Nintendo's long-held dominance in the mobile gaming market, according to the latest market research. 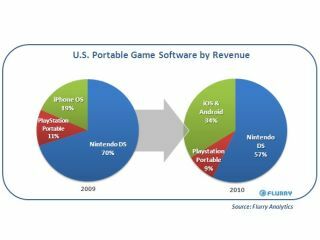 While traditional console gaming remains strong, the latest market research data from Flurry and the NPD Group shows that Apple's iPhone, iPod touch and iPad is taking a serious bite out of Nintendo's market share in the portable gaming market. Nintendo recently launched its new 3DS handheld in the UK, with hardened Nintendo fans and aficionados of in-depth gaming on the go certain to continue supporting the Mario factory's portable gaming initiatives for the foreseeable future. However, that said, Flurry's latest market data claims that Nintendo's market share has dropped a whopping 13 per cent, from 70 per cent in 2009 to 57 per cent in 2010, with iOS and Android smartphone gaming to blame. Whether the 3DS and the new Sony NGP can reverse this trend over the coming three to five years remains to be seen. Flurry combines gaming market data from the NPD Group with its own estimates of game category revenues from iOS and Android devices, taken from Flurry Analytics, the company's mobile application analytics service, which "tracks more than 12 billion anonymous, aggregated use sessions per month across more than 80,000 applications." 40 per cent of these app sessions are spent on mobile games. "We estimate that iOS and Android game revenue increased from $500 million in 2009 to more than $800 million in 2010," notes the research group. "Of this, the significant majority of revenue was generated by iPhone games. "It's clear that prolific installed base gains by Apple and Android devices, low priced games (including a very robust free-to-play model enabled by in-app purchases) and seamless digital distribution to games on devices so near to consumers 24-hours-a-day, is driving potent industry-disruption. "Over 2011, we expect to see continued and significant smart-device game growth fuelled by the recent launch of iPad 2, iPhone coming into distribution on Verizon, the expected release of iPhone 5, a relentless expansion of Android devices by leading OEMs across all major U.S. carriers, and Google's enablement of in-app purchase billing, a proven key driver in iOS game revenue."